Hi, I have BMW radio professional and TCU unit in the trunk on my E92 2009. I would like to add USB functionality. Could I simply replace TCU by MULF2? Are sockets on TCU and MULF2 the same? Would I need some kind of socket adapter wires? I would loose only SOS button by doing this replacement? already lost it. Due to its only 2g and there is no 2g anymore. Yes you can do that but it might be easier to do this. My car is from USA, but I live in Lithuania currently, I wonder does SOS button work here in Europe? If it does not work that makes perfect sense to remove TCU and install MULF2. Its a bit cheaper than "Bluetooth Streaming Box" as I prefer USB, and its maybe more clean to have one MULF2 than TCU+BluetoothStreamingBox. I will test SOS button tomorrow and see what does it do. and sd slot and a usb slot both of which play music files. subscription service. Don't know about the rest of the World. Which is actually the one in the installation link. Last edited by ctuna; 02-10-2019 at 06:39 PM. I tried pressing SOS button today and it seems that it does nothing. I think it might be coded out already, how could I check that? How could I fix it and read 2URAD and TCUM? First of all do you have Inpa working? the hardware with the F2 and F3 functions. You should list the year and model of the car. find out the options the car came with . you can read the cars modules with Inpa. See bimmerprofs page one Inpa functional jobs. Last edited by ctuna; 02-11-2019 at 02:34 PM. I had done some coding with NCSExpert before like removing TPMS and coding it to work with FTM. So Inpa and NCSExpert should be configured correctly. Last edited by Hotter; 02-11-2019 at 02:44 PM. from first printout Rad2 = mostgateway. Last edited by ctuna; 02-11-2019 at 03:48 PM. In NCSExpert it writes as 2URAD. Not sure why NCSExpert has different module names?.. As I understand you cant read 2URAD (RAD2) and TCUM (TCU) modules with D-Can cable from ebay. Only code them with VO values. Hopefully I wont need backup. I will think about which module its better for me to buy, and will need to wait for shipping... I will write DIY after if I will have success. without Icom. I think the cutoff date was 3/07 build in the US. that way as as far as I know. you from being able to code those modules even in older car. are the ones I know about. another one where Icom is needed on newer cars. I know the name of the Radio software changed at some point. radio. Also this is another vague area. I got offer with great price for MULF2 in my local area so I could not resist and bought it. I already switched it with TCU. Changing places TCU to MULF2 was not hard, though TCU connector is a bit different so I needed to trim connector a bit to fit to MULF2. I did not do any coding yet. I am getting SOS error in instrument cluster. I already saw USB icon on Radio, when clicking on USB icon I get "Insert" message (don't have USB cable, so cant test it, shipping from ebay will taike time...) so it seems to work? Is this what I need to do to disable SOS? Or do I need to remove something from VO? I also noticed that AUX is not working any more. I guess its switched to MULF2 AUX? How to switch it back to radio AUX? Last edited by Hotter; 02-14-2019 at 03:51 PM. not . No choice . compare it to other aktiv spellings. You should only have to remove nicht anyway. of the adapter cables for the TCU. Bluetooth is contained in the Mulf module to for phone. see entry 8 in the above. Last edited by ctuna; 02-14-2019 at 04:17 PM. Also in MULF2 HIGH I wrote my VIN with Tool32 -> ULF2_hi.prg -> c_fg_schreiben. 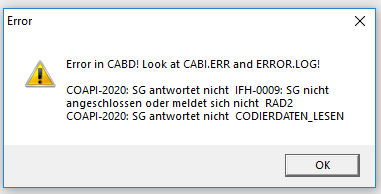 SOS error does not appear any more, but Radio shows all the same menus as before: USB with "- -" icon, no Bluetooth and BMW assist is still there. 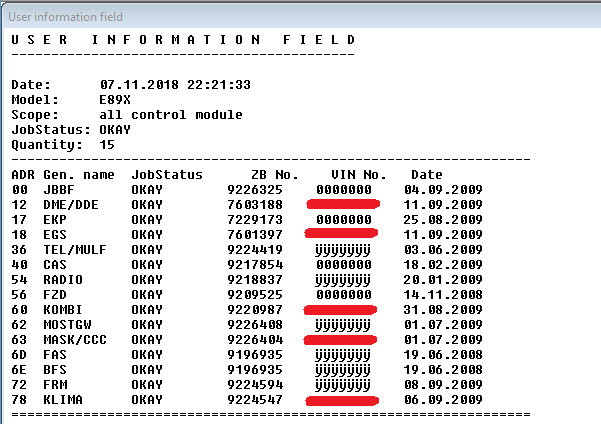 I believe I need to reset 2URAD (RAD2) to factory default? I also tried to do SG_RESET on 2URAD (RAD2), Radio screen went off and on but nothing has changed, all the same menus are there. Last edited by Hotter; 02-17-2019 at 11:57 AM. are turned on and off. I believe ulf is the Mulf or usb . coderiedn lessen literally mean read the code. Last edited by ctuna; 02-17-2019 at 02:08 PM. Below is my thread where I retrofitted a MULF2 HI into an 06 using the TCU wiring. Your current aux wire may go to the head unit so you may need to run a new one to the trunk. If I were to do this mod again, I would just hook a tune2air (bluetooth music) to the MULF2 HI and leave it in the trunk. ebay has some generic standar USB to bmw USB connectors. Aux in is a few new pins added to your TCU wiring. Most MULF2 HI have the bluetooth phone disabled. In the US, they are normally just used for USB. You may need to enable BT in the module via coding.